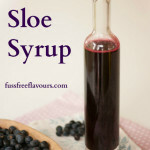 Sloes are not just for gin. Although sloe gin is one of my favourite drinks and picking sloes and making it is a yearly ritual. Every time I pick sloes I do wonder who persevered and found ways of making these bitter tannic berries edible. And I am grateful. 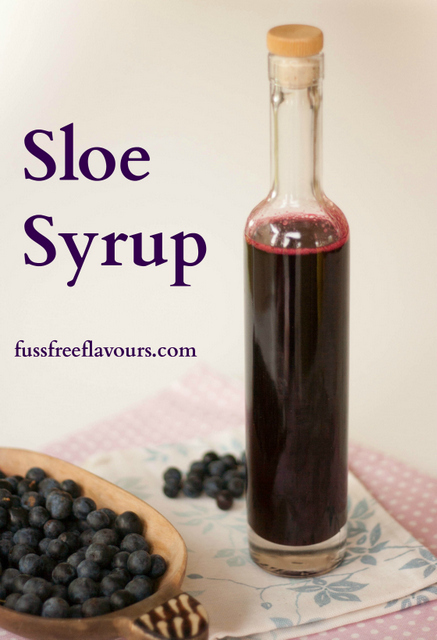 If you try this Sloe Syrup – Harvesting the Blackthorn please tag #FussFreeFlavours on Instagram or Twitter. It is amazing for me when for me when you make one of my recipes and I really do love to see them. You can also share it on my Facebook page. Please pin this recipe to Pinterest too! Thanks for reading Fuss Free Flavours! Simply place all the ingredients into a saucepan and gently simmer for about 40 minutes until the sloes have burst and you have a beautiful deep purple syrup. Pass through a metal sieve and then strain again through a cheese cloth. Keep in the fridge and use within a week, or freeze.